Our guest writer today is quite interesting and unique! 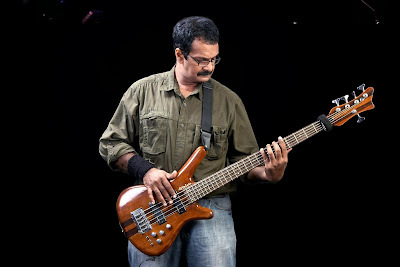 Jayen Varma of India holds the World Record in Bass Guitar as ‘Fastest Bassist’. This was declared by The Registry of Official World Records (Record Holders Republic) USA & UK in the year 2008. He plays Bass Guitar in the same way that the Indian percussion instruments Tabla, Mridangam and Kanjira are played. Jayen is another one of myspace friends that I asked to be a guest writer. As our guest writer, I sent Jayen a bunch of questions and asked him to answer them. Let's see what he has to say about the blues scene in India and how someone becomes the World Fastest Bass Player! 1) What made you want to be the fastest bass player? My tough times in life!!! In 2004, I had to sell my one and only bass guitar, which I call ‘the tough times in my life’ or my blues. Since I did not have a bass guitar for around three years, I resorted to do only finger exercises on my mobile phone and a tool which I made myself. Having no bass guitar was a blessing in disguise! Slowly, I realized that I was getting better in speed with the finger exercises. At the end of 2006, I got a 150 USD bass guitar and decided to make my playing official and created a World Record in 2008. 2) How did you prepare for it? I was doing a job other than music till 2008, playing bass guitar part time in professional bands since 1986 and learning the bass lines of hundreds of cover songs by different bands. Before that I was playing drums and the Indian classical percussion instrument mridangam. Everyday I had to sit three hours in a train since my work was in a very distant place, so during the ride I practiced. I used to practice around seven hours a day. With the help of a few musicians and sound engineering friends, I verified my playing speed using computers in studios. I had read that Adrian Davison of USA used to play piano style bass at 31 notes per second. I decided to make my playing a record and completed all the official formalities with The Registry of Official World Records USA and UK. After verification they confirmed in 2008 that my playing was 36 percussive notes per second. 3) Do you think you're the only fast bassist? No, I do not think so. There are many fast bass players with different styles and techniques in the world. They may not be interested in going for a record. I cannot even imagine how they play their styles so beautifully. I did it because I just wanted to do it. I am still learning to be good in making good music and grooves. 4) What is Indian Slap Bass and how did you develop it? I never had a bass instructor, so I had to play according to my convenience. Since I had a little knowledge of the Indian classical percussion instrument mridangam and ragas, I was applying Indian classical raga scales with mridangam/tabla style percussive playing on the Bass Guitar. It became a new genre of unconventional funk bass. It is slapping the strings without using thump, but hitting with 1st then 2nd and 3rd fingers held together, like playing tabla. The playing style is slightly different from the usual slab bass when backing Indian classical music. 5) Is there a blues foundation in India? Though nothing as big as in the west, the blues and jazz lovers in India have formed certain communities and created special events to make things alive every year. Thanks to all who are responsible for this. 6) Which is your bass Guitar? Now I play an Indian handmade 5 string bass guitar named Stelsie. Cost of my guitar is below 300 USD. There are many good luthiers in India and in India we get good wood to build the body. 7) Could you tell us about the music culture in India? Are there clubs to play? Is there much blues music? Indian music culture is based on Indian classical music. I have to say that nowadays Indian classical music is more appreciated outside India, since the masses in India are for commercial filmy pop music. The film industry is a very profitable business in India. Film singers are more popular than other musicians here. So the best places for blues, jazz and classical musicians from India are in countries outside India. There are of course clubs in India to perform blues and jazz. 8) What are some of the challenges a musician faces in India? Like I said, Indian classical music, blues and jazz are comparatively less popular in India compared to filmy pop music. So blues and jazz musicians find it hard to survive and they often look forward to collaborating with musicians outside India. Though there is a good response for blues in India, blues and classical musicians are paid a very low remuneration compared to cinema singers. There are some hotels and clubs in some cities hosting blues. This is of course a blessing for the musicians. 9) What do you wish to yet accomplishment in music? I hope to popularize Tabla style Indian Slap Bass across the World and also wish to make sure that this kind of slap bass can be used in Indian classical music as well as blues and jazz. I am yet to release an album. I am also serving the underprivileged, disabled and homeless children to discover the real potential within them by igniting their minds. I desire to make an international project to help the children. 9) What are your favorite blues songs to play? I love songs like Hoochie Coochie Man, Five long years, Still Got The Blues, Down In The Hole and many more, I really love 12 bar blues. I enjoy blues artists like B.B.King, Muddy Waters, Jimmy Hendrix, Bob Dylan, Howlin’ Wolf, Tina Turner, Robert Cray, Janis Joplin, Jim Morrison, Eric Clapton, John Mayall, Keith Richards, the list goes on and on. 10) Who inspires you the most? I love all the bassists. I have been learning bass by watching videos and listening to bass lines by different electric bassists like Jaco Pastorius, Bootsy Collins, Jeff Berlin, Stuart Hamm, Billy Sheehan, Billy Cox, John EntWistle, Abraham Laboriel Sr, Larry Graham, Victor Wooten and many others. Every Bassist inspires me. And I love to see anyone holding a bass guitar. 11) Who were the artists that influenced your work? Many musicians, I cannot name just a few. But I got the idea of pace from the name Shadkala Govinda Marar of India who lived in 1700-1800 AD. He was considered the fastest singer who ever lived in India. He used to sing at demi semi quaver speed (32nd notes). Playing fast may not always be music, but many musicians have experimented with it, even centuries back. 12) Where can we find you? Internet, radio, TV, appearances? 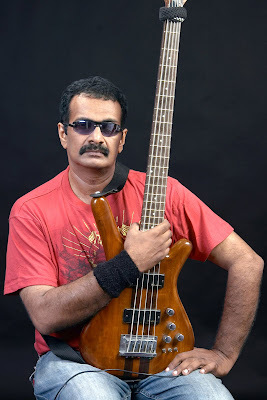 It is hard to do something with bass guitar from India in the international arena. The easiest way to know the music outside India is via the Internet. In the 70s and 80s I used to regularly listen to rock, blues and jazz from radio stations like Voice of America, Radio Australia, BBC etc. I even received letters and photos of Willis Conover and Duke Ellington in the 80s by posting on Voice of America, since I used to regularly listen to the jazz hour and respond to them by sending letters from India. In the 90s availability of CDs and tapes became easy. Of course I have been featured on Radio and TV stations in India and elsewhere. MySpace, Facebook and Twitter are the places where I interact with musicians. Thank you for reading American Blues News! Copyright © 2009 Monica L. Yasher/Jayen Varma. All Rights Reserved. Photo Copyright © 2009 Jayen Varma. All Rights Reserved. To purchase the rights to reprint this article, please email info@americanbluesnews.com.